From 54 floors up on the tallest building in the Austin Skyline, the view is grand looking north. From this balcony of the Austonian, the 683 foot residential building that opened in 2010, you have a view of the iconic Frost Tower, the Texas State Capitol, the UT Tower, and DKR Texas Memorial Stadium. Congress Avenue leads up to the Austin capitol, and the trees that line this street are lit year round. To the east, I-35 winds through Austin heading north to Waco and south to San Antonio. 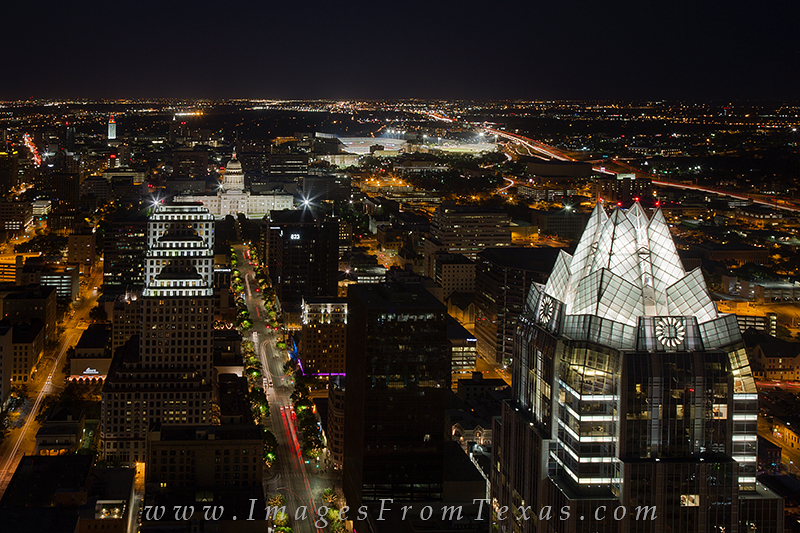 This Austin Skyline Image was taken from a balcony of one of the penthouses of the Austonian. Photo © copyright by Rob Greebon.